Meteora is a place that combines a unique geological phenomenon and a monastic community. Six active monasteries exist today; all placed on top the immense rocks of Meteora. Go on an unforgettable journey that will bring you back in time to walk on the footsteps of Meteora’s monks. You will be guided on the secret trails of Meteora, the same ancient trails the monks used for centuries, in order to learn the history and to discover all the hidden gems of this place. This 2-days itinerary is one of the most unique hikes that you can experience in Greece. 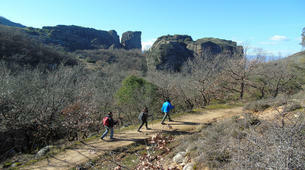 On the morning of the first day you will join the hiking tour of Meteora. The hike starts on the foothills of Doupiani rock, right beneath the old ruins of Pantokrator monastery. From there you will walk literally among giant rocks, between these massive rock pillars of Meteora towards the northern side of the rocks. With this morning hike you’ll have the chance to visit the monastery of Great Meteoron and you will learn all the stories behind each landmark. On the afternoon hike you will discover the caves of the monks near the village of Kastraki. This afternoon hike will take you on the rock of “Holy Spirit” some 200 meters above the village where the first anchorite of Meteora lived more than a thousand years ago. 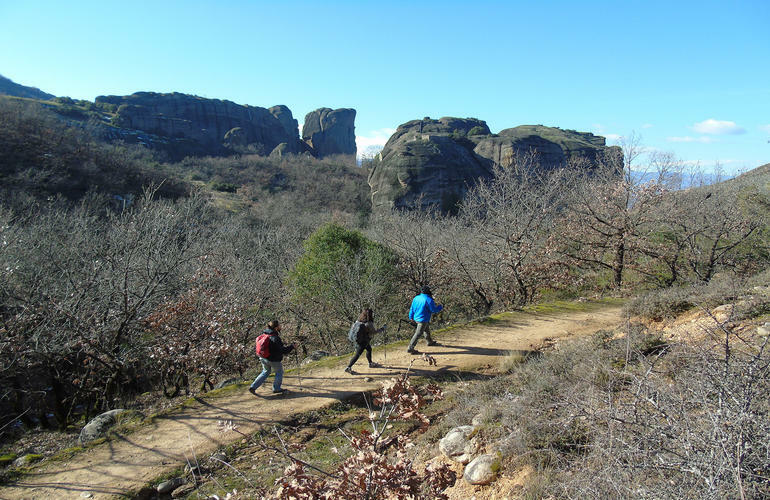 On the second day you will join a hiking and scramble tour through the most ancient trail to reach out to the highest rock of Meteora - 400 meters above the town of Kalambaka. Enjoy a great adventure in a unique place with unparalleled breathtaking views that you will never forget. All necessary equipment is provided by the guides. No previous experience required to participate as the guides will show the basics before going hiking, however a good physical level is necessary to hike on the rock. Tour operates in all weather conditions so you should dress according to weather requirements. There is a limit of 12 people on this small-group hiking tour. In case you are a bigger group you will be split in smaller groups. You should respect the holiness of the spot, you are expected to keep it clean and seek the right balance between tourism and spiritual activities as there are monks who pray throughout the day.